004 | The Great Adventure's of Cubicle Bear! When we left off, Spacebear had just declared himself a LIAR, dooming IB on the cubicle precipice! But Spacebear lacks a basic knowledge of cubicle bears. 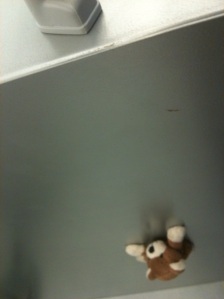 Our hero can climb cubicle walls! Perhaps Spacebear should have used his ray gun instead. The demented and unsuspecting Spacebear relaxes at the top in triumph, while IB takes a swig from his flask and continues the vertical journey.